If you are considering surgery there is always a risk of death due to the procedure or anesthesia that is given during the procedure. This is true of outpatient procedures and inpatient procedures, even with the surgery is an optional procedure such as plastic surgery. While there is always a risk of death, this risk varies widely between types of surgeries and patients. This is why surgery should never be taken lightly, the possibility of death is very real, even with minor dental procedures. To be clear, some surgeries have a much higher risk level than others. It is very rare for a healthy individual to die during a minor dental procedure. Other procedures are much higher risk for anyone who chooses to have surgery. For example, during some open heart surgeries, the heart is actually stopped for almost an hour before being restarted. That surgery has a higher risk than carpal tunnel surgery which is performed on a patient’s hand and wrist, often in an outpatient surgery center. Your personal health history (including diabetes, breathing problems, and smoking history), age, weight, family health history and your general state of health will directly impact your personal level of risk when having surgery. A healthy person will have lower risk than an unhealthy person. A person with an infection will be more at risk than people who do not have an infection. A non-smoker will have lower risk than a smoker and a physically active person will have a lower risk than a sedentary person who spends too much time on the couch. Other personal risk factors include breathing issues, problems with blood clotting, abuse of drugs or alcohol, and the presence of one or more chronic diseases such as diabetes. The type of surgery being performed will play a huge role in how high the risk of death will be during any given procedure. A brain surgery will be higher risk than a toe surgery. A heart surgery will typically have a higher risk than cosmetic surgery, partially because heart surgery is only done when an individual has a heart problem, but cosmetic surgery is often done to enhance the appearance with no medical issues present. Surgeries related to trauma, such as a serious car accident, have a higher risk level than a planned and scheduled procedure. If you have had issues with anesthesia in the past, you are more likely to have complications with anesthesia during any future procedures. In some cases, you are more likely to have anesthesia issues if a close family member has had issues. One serious reaction to anesthesia, malignant hyperthermia, is genetic and causes the patient to have a very high fever along with other issues when exposed to anesthesia. The skill of the anesthesia provider, like the skill of the surgeon, will also play a role in your level of risk. and many more variables play a role in your personal risk level when it comes to dying during surgery. It is also important to know that deaths during and immediately after surgery are usually a result of a reaction to anesthesia rather than an issue with the surgical procedure itself. If you are considering surgery, ask your surgeon about the risk of death during the procedure you are planning. Your doctor can take your personal health into account, along with the typical risks of the procedure, to give you a more accurate idea of your personal level of risk. It is not unreasonable to ask for your risk as a number, as in "there is a five percent risk of death during this procedure." Learn more about the risks of surgery. Discuss your concerns with your surgeon and find out what kind of risk is involved in the surgery you need. 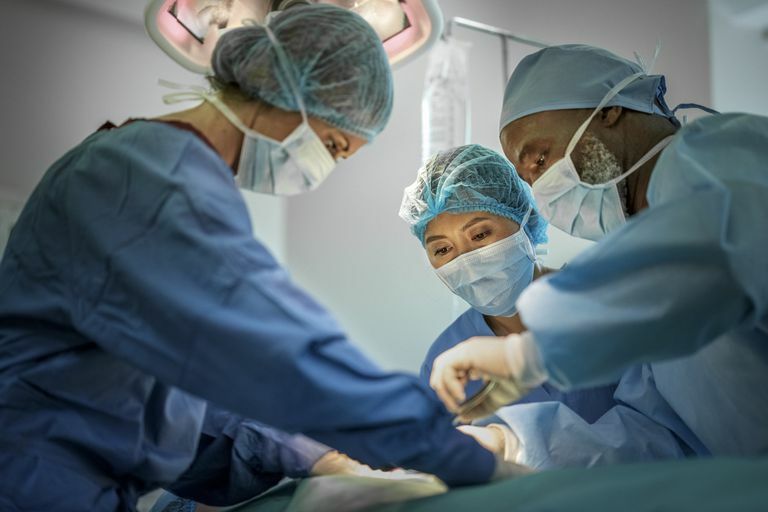 Understanding your surgical risk and why your risk level is what it is can be very helpful when preparing for surgery because it can allow you to take action to reduce that risk before the procedure happens. Stopping smoking, for example, before surgery can dramatically reduce the chances of being on a ventilator for a prolonged period of time. Getting glucose levels under control prior to surgery can dramatically improve the outcome for diabetics who might not have been paying as much attention to their health as they should have. About the ACS Risk Calculator. American College of Surgeons.